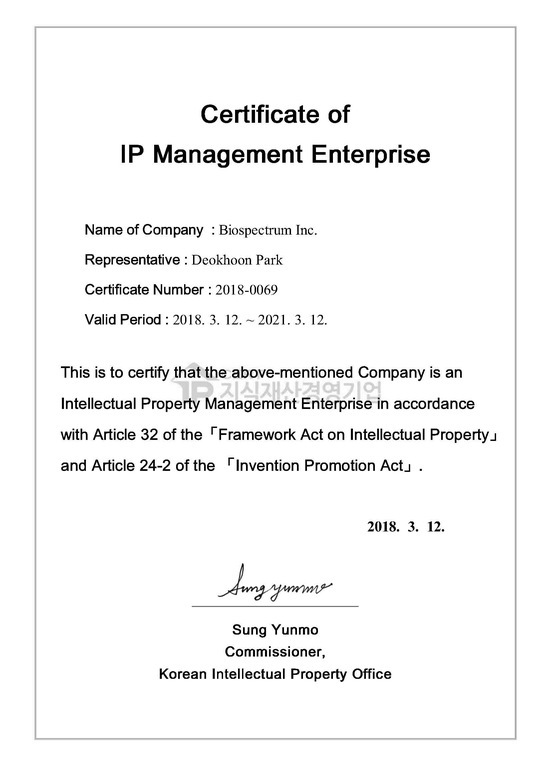 BioSpectrum, Inc. (CEO Dr. Deokhoon Park) acquired the certificate of IP management enterprise for SMEs from Korean Intellectual Property Office (KIPO). A KIPO-affiliated organization, the Korean Invention Promotion Association (KIPA) operates the intellectual property (IP) management certification system for SMEs. This certificate is for SMEs who have continued their business activities to increase corporate value by creating profit through the management strategies that utilize the IPs such as patents, utility models, designs, and trademarks as corporate assets. It is aimed at strengthening the capability of SMEs to manage their IP and at discovering and fostering any hidden-excellent companies. Through this achievement, BioSpectrum, Inc. can receive various benefits such as granting additional points when participating in the KIPO business or technology development support project. Since its establishment in 2000, BioSpectrum, Inc. has been launching the market-leading products every year through the innovations such as staffing the specialized researchers at high ratio and a steady investment in R&D of 15-20% of annual sales. BioSpectrum, Inc. has been recognized for its superior research capabilities based on more than 100 patents and papers. In 2010, Dr. Park (CEO) was selected as an 'outstanding patent researcher' by the KIPO in recognition of these achievement. “Through this acquisition of the certificate, we once again confirmed our research capability and the IP management capability. In order to establish BioSpectrum, Inc. as a research-oriented company that jump up to be a leading company in the world, we will accelerate the research and establish our IP-based business strategy,” Dr. Park said.